Restoring ancient houses offered this former carpenter and his son a way to make a living, while also helping families continue to gather in their valuable ancestral homes. Tuan Tran and Ha Nguyen report. As a public employee, Le Van Tang couldn't earn a living to support his five children. But today, he and his son, Le Van Vinh, have made a name for themselves restoring ancient houses. Tang's grandfather, father and elder brothers worked as carpenters for decades in the small village of Dien Ban, located in the central province of Quang Nam. But in the new market economy of the 1990s, as people rushed to build houses out of other materials, many carpenters had to switch occupations. Tang worked at a pig breeding enterprise under the Ministry of Agriculture and Rural Development, travelling to HCM City to buy pigs and bringing them back to Quang Nam to breed for co-operatives and individuals. In 1997, he decided to quit his job and return to his home village - and the family's occupation. "I met many difficulties when starting my new career, which forced my son Vinh to leave his school to go to the northern port city of Hai Phong to work in construction sites," Tang recalled. In 1999, when Hoi An Ancient Town and the My Son Towers were recognised by UNESCO as World Heritage sites, Tang realised that this provided him with a valuable opportunity. His home village is located between Hoi An and My Son, so he spent several months visiting ancient houses in Quang Nam, where he was "shocked" to see that "thousands of valuable ancient houses were damaged and ruined." After discussion with his wife, he borrowed several taels of gold from his relatives and recruited a group of workers to buy an ancient house and restore it. "We had to work very hard day and night to restore that house. After three months, we resold it to a trader in HCM City, earning a triple profit," said Tang. After five years, his group restored thousands of old houses across Viet Nam. Huynh Thanh Tuy also in Quang Nam signed a contract with Tang to restore his ancestral house in Dien Duong Village, which he previously thought was ruined forever. "At first I thought our ancestors' house could not be restored because it was little more than a ruin. Then I heard about Tang," Tuy said. Seven months later, the house was restored and the extended family could once again meet in the house to celebrate the death anniversaries of their ancestors and other special occasions. Tang's son, Vinh, returned home to set up his own company, Vinahouse. Each month Vinahouse restores several ancient houses in Viet Nam, Cambodia and Thailand. So far the company has restored and renovated a total of 150,000 buildings. 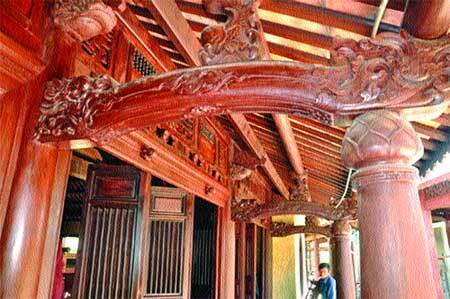 "Vinh's wooden architecture can be seen at many resorts, cultural and historical sites and temples and pagodas nationwide," said architect Nguyen Hoang from HCM City, adding that he hoped this success would boost tourism development. Building buildup: Tang examines a design for conical houses of four and six floors that he is preparing to construct. 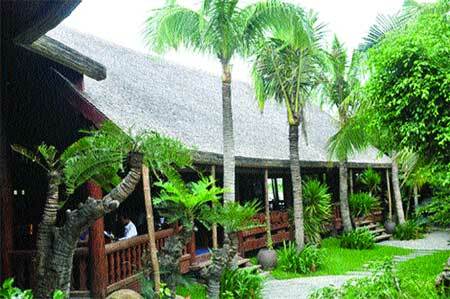 Vinh's 11,000sq.m property, near the road from Vinh Dien to Hoi An, consists of many old houses. These include a 200-year-old Quang Nam-style house with 108 wooden pillars that has been the subject of research by many Japanese architects. "They are also interested in a 102-year-old bamboo house belonging to a family in Dien Minh Commune, which is the oldest in the country," Vinh said. His company had to spend almost one year in restoring the house so that beds, grinders and other objects could be preserved intact. Vinh recently built three giant cone-shaped houses, inspired by a woman wearing a hat and using more than 2.4 million pieces of dried coconut shell, that have just been recognised with a national Guinness record. 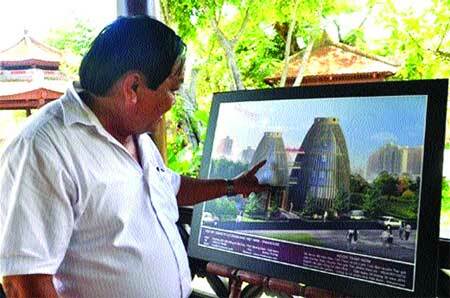 In addition, his company is constructing twin wood towers at Viettown in Dien Ban's Dien Duong Commune near Ha My beach.